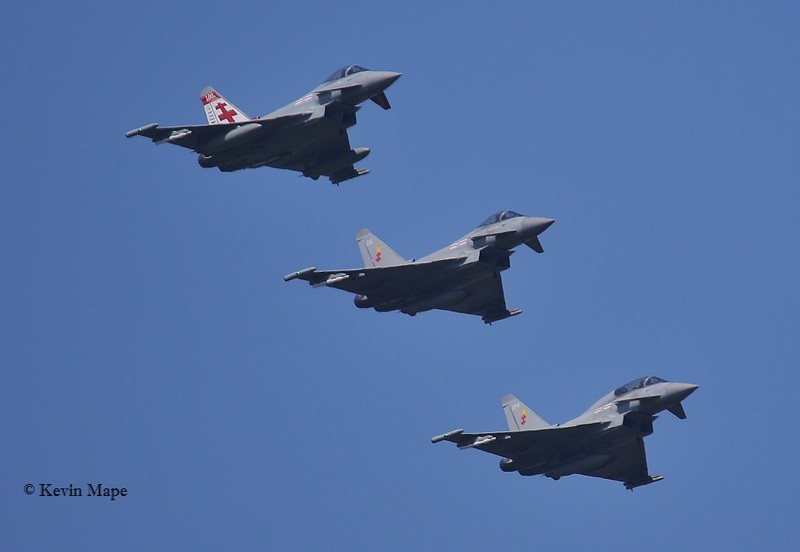 The Air show season has started, So BBMF and Typhoon Display Team will be active over the Weekends. 1st Sun Log thanks to Garf. QRA – Intercepted a Air France BAE 146 and escorted it into Newcastle Airport. 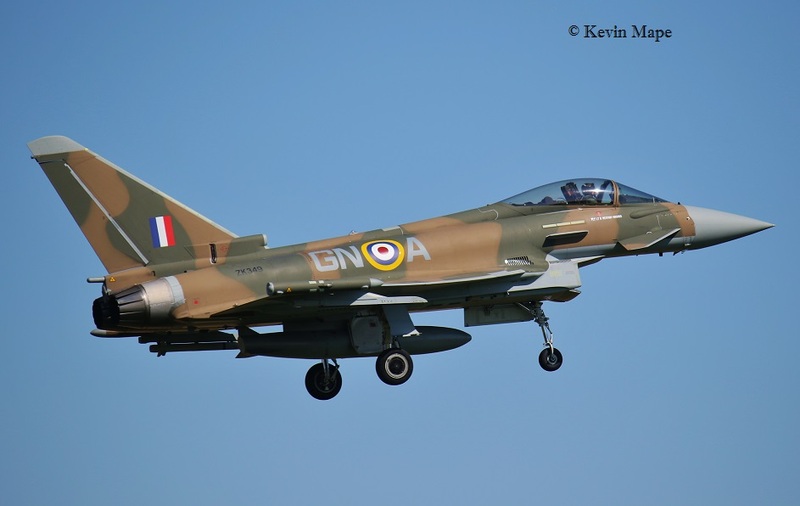 ZK320/BR/29(R)Sqn/Typhoon FGR4 c/s “Typhoon 35” – Displayed at Scampton. 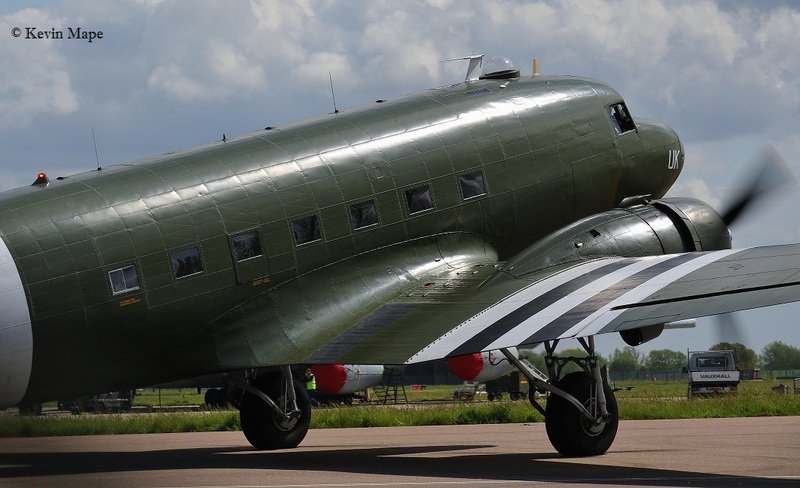 ZA947/UK/BBMF/Dakota III c/s “Rafair 7000” – To Holland. 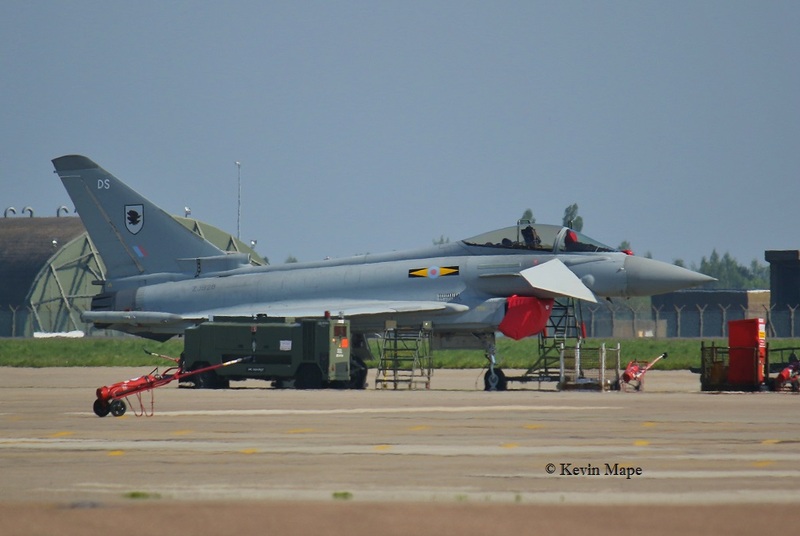 ZJ809/EY/6Sqn/Typhoon T3 c/s “Lossie 27” – Parked on the ASP. G-MAJH/JH/Eastern/Jetstream 41 c/s “East Flt 105” in “106” – out. 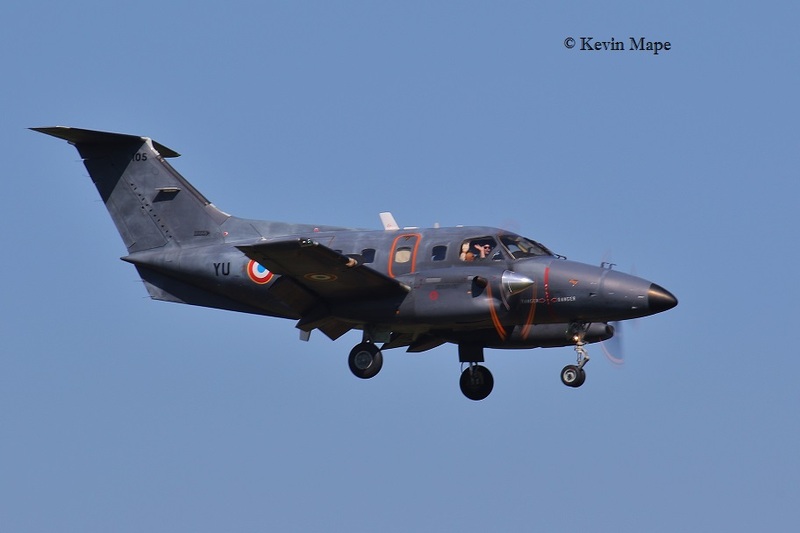 N242CV/Carol Vorderman/DA42 Twin Star c/s “N242CV” – To BBMF. PZ865/EG-S/BBMF/Hurricane IIc c/s “Hurricane 02” – PDA Display. 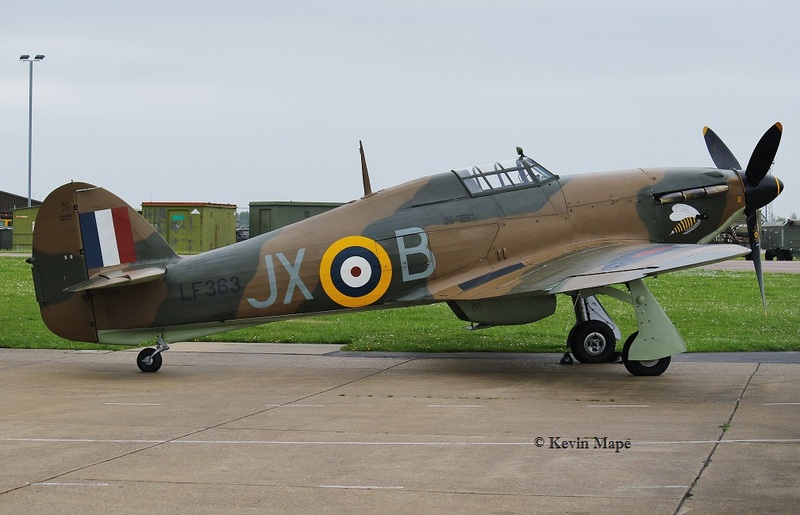 LF363/JX-B/BBMF/Hurricane IIc c/s “Hurricane 96” – PDA Dislpay. ZK325/FK/1(F)Sqn/Typhoon FGR4 c/s “Typhoon 111” – PD Valley. 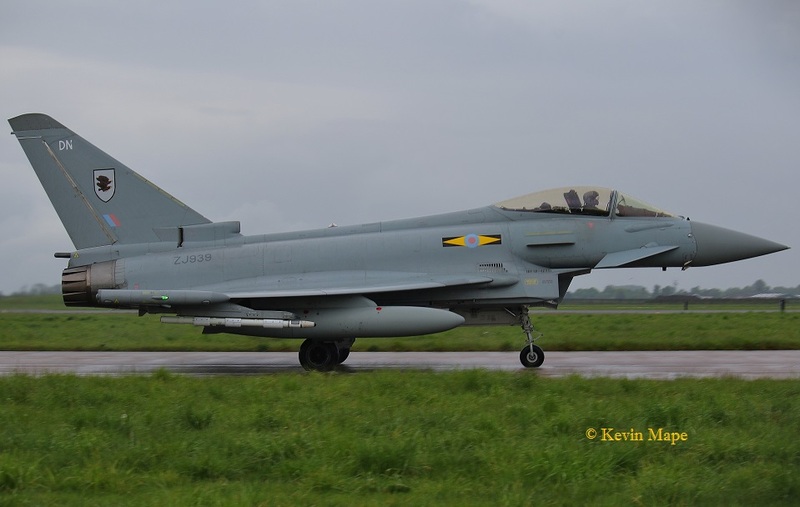 ZK322/GS/Unmarked/Typhoon FGR4 c/s “Lossie 92” – To Foxtrot – Delivery to 3(F)Sqn. 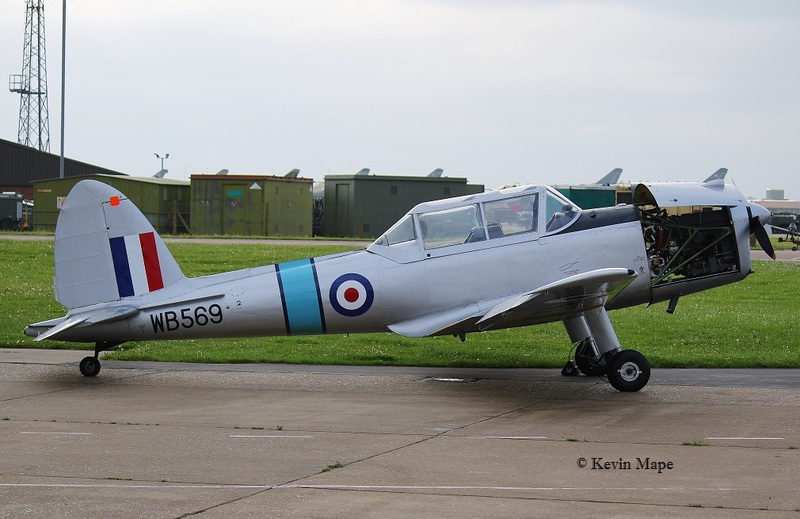 G-CGKF/KF/3FTS/Tutor T1 c/s “Cranwell 92” – Overshoot. ZA947/UK/BBMF/Dakota III c/s “Rafair 7000” – Return from Holland. 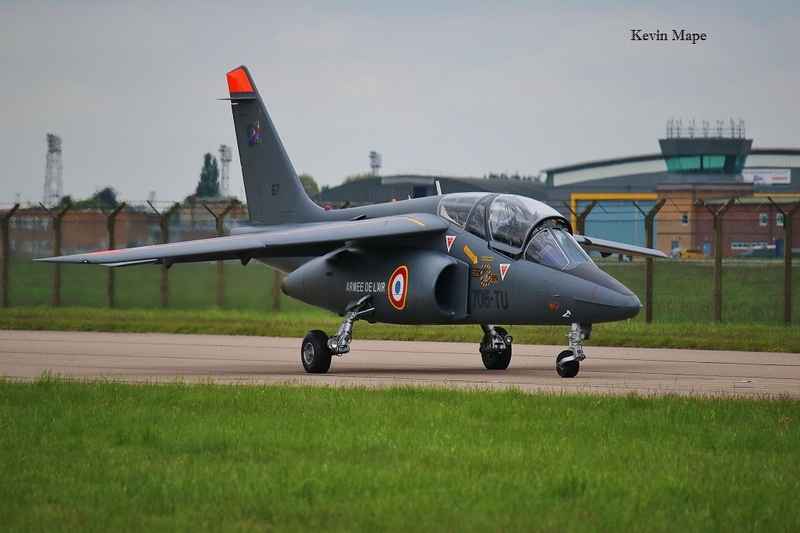 G-BYXG/XG/3FTS/Tutor T1 c/s “Cranwell 52” – Overshoot. 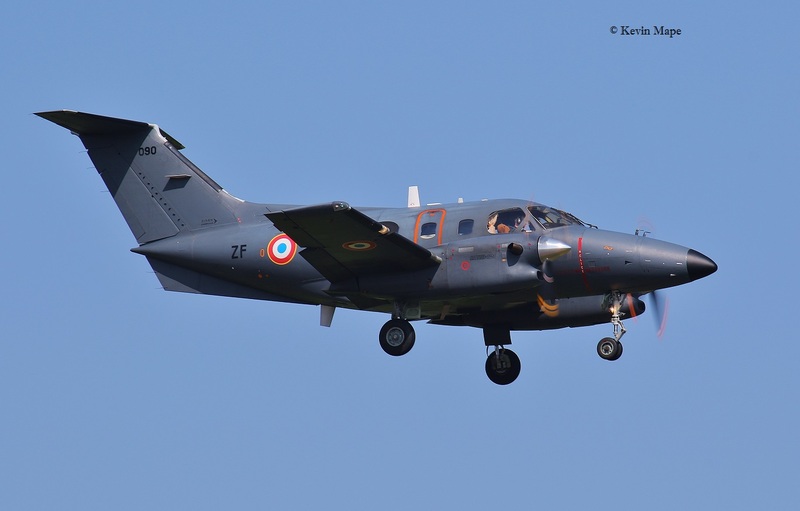 ZK458/D/45(R)Sqn/King Air B200GT c/s “Cranwell 77” – Overshoot. 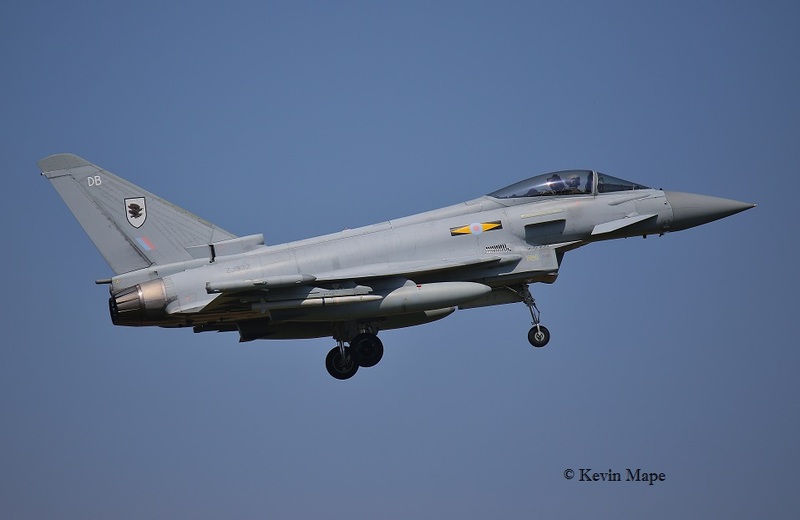 ZJ809/EY/6Sqn/Typhoon T3 c/s “Lossie 03” – Flew a mission then returned. ZJ809/EY/6Sqn/Typhoon T3 c/s “Lossie 31” – To Lossiemouth. TE311/4D-V/BBMF/Spitfire LF XVIe c/s “Fighter 1” – Display practice. 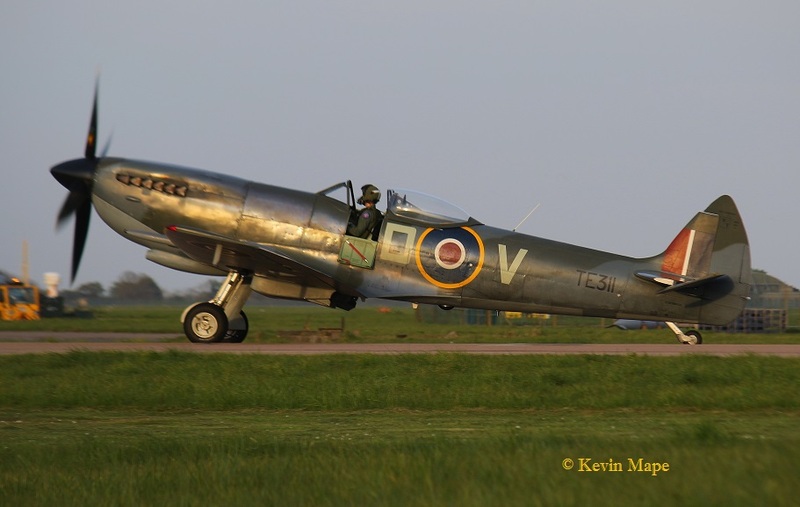 TE311/4D-V/BBMF/Spitfire LF XVIe c/s “Fighter 1” – Flypast at Wittering & Coningsby. ZK347/EF/6Sqn/Typhoon FGR4 c/s “********************” – To TMF. No.089/YJ/EAT00.319/Xingu c/s “Cotam 1720” – Parked on Sierra. 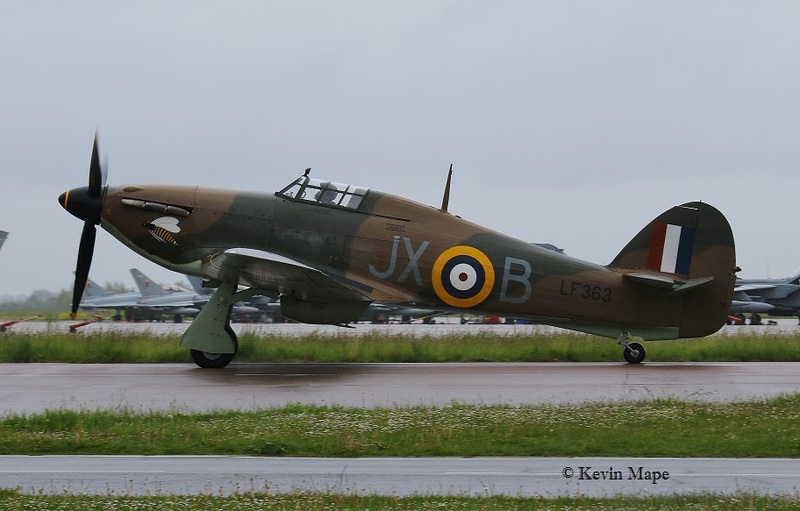 LF363/JX-B/BBMF/Hurricane IIc c/s “Hurricane 90” – Test flight. 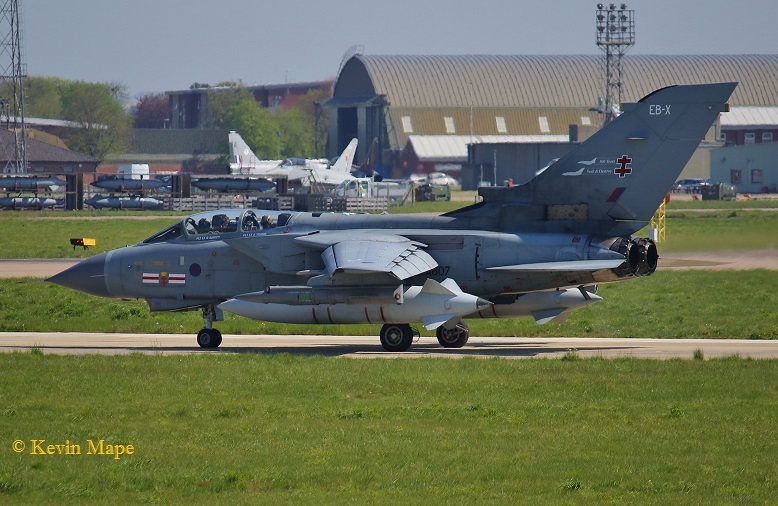 ZA607/EB-X/41(R)TES/Tornado GR4 c/s “Rebel 84” – To Donna nook. 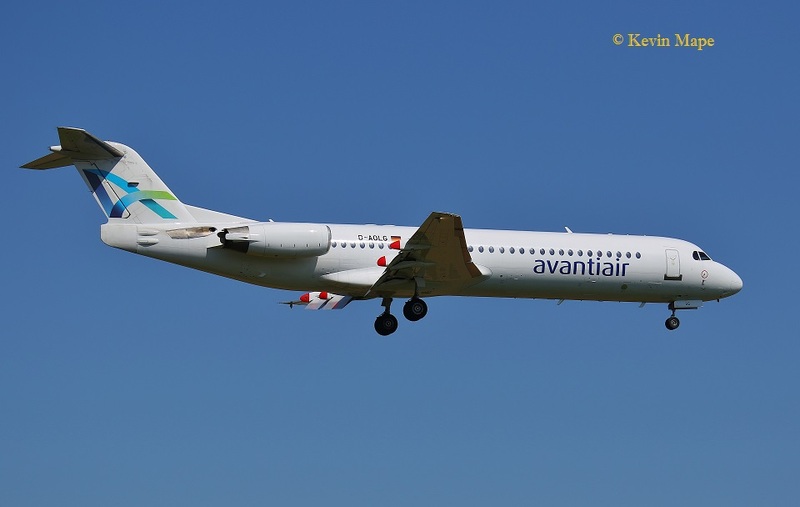 D-AOLG/Avantiair/Fokker 100 c/s “3 Victor 5110” – Departed. 10th Tue Log thanks to Garf,Mark,Steve & Val. ZJ939/DN/XI(F)Sqn/Typhoon FGR4 c/s “Razor 12” – PD at Valley. ZJ925/DXI/XI(F)Sqn/Typhoon FGR4 c/s “Razor 13” – PD Leeming. 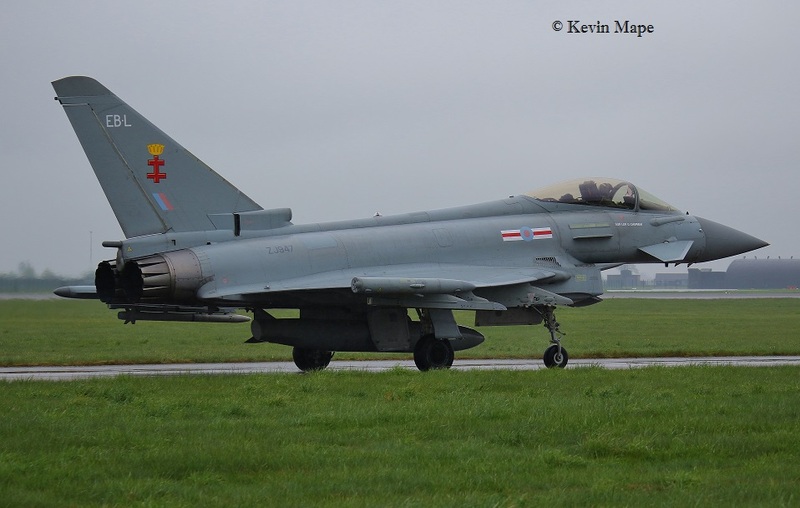 ZJ939/DN/XI(F)Sqn/Typhoon FGR4 c/s “Razor 32” – PD at Lossie then PD at St Mawgan. 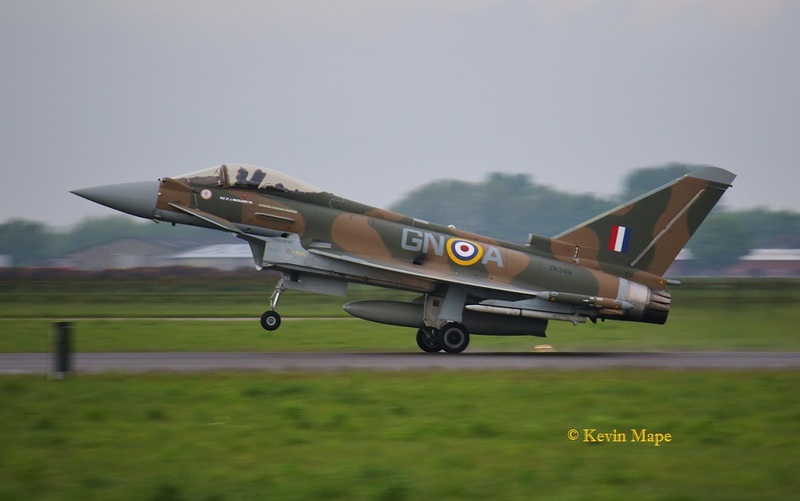 ZK349/GN-A/29(R)Sqn special/Typhoon FGR4 c/s “Gunfighter 51” – Bird strike on landing. 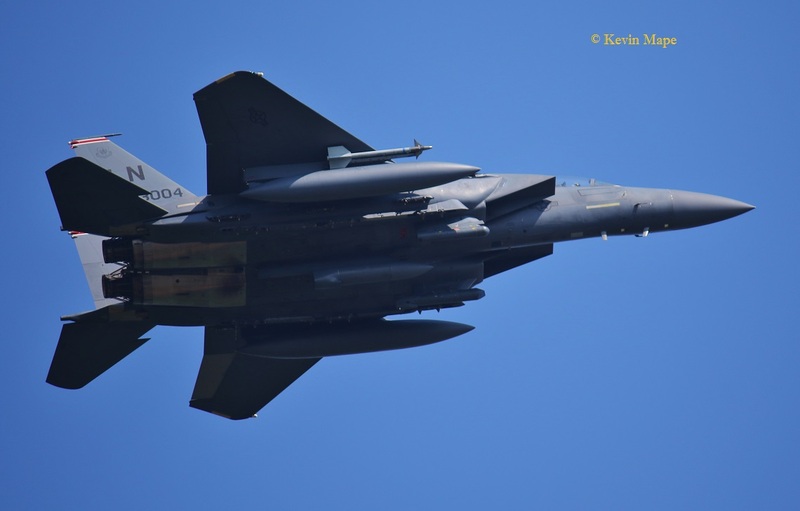 01-3001/LN rd 494FS/F-15E c/s “Maul 24” – two overshoots. G-MAJH/JH/Eastern/Jetstream 41 c/s “East Flt 101” in “102” – out. 84007/847/TSFE/Tp84 Hercules c/s “Mike Tango Yankee 847” to Donna Nook.Flare trials. 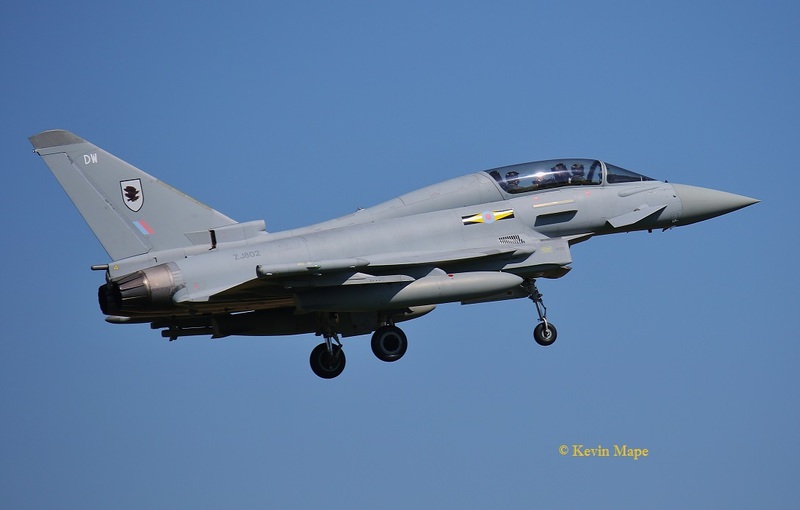 ZJ803/GN-A/29(R)Sqn special/Typhoon FGR4 c/s “Triplex 22” – Ground abort. ZJ808/BP/29(R)Sqn/Typhoon T3 c/s “Typhoon 45” – Ground abort. LF363/JX-B/BBMF/Hurricane IIc c/s “Hurricane 92”- Taxy runs. 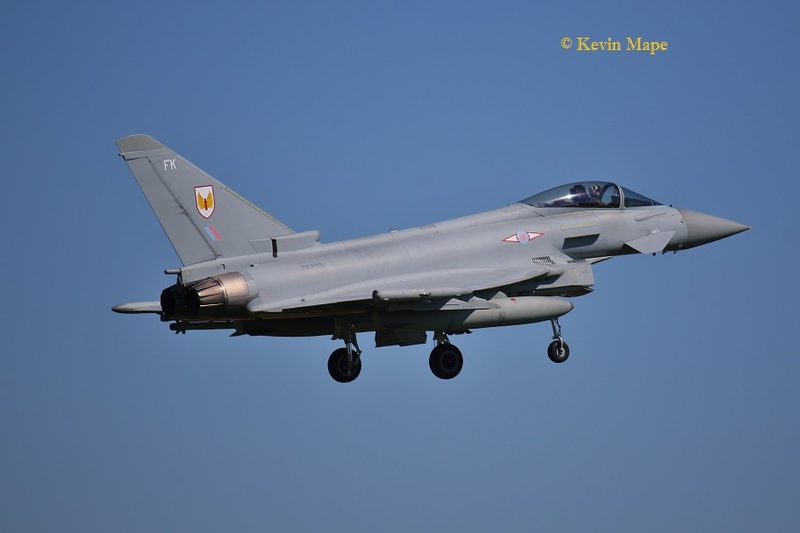 ZK353/BQ/29(R)Sqn/Typhoon FGR4 c/s “Typhoon 35” – Display. ZK315/41(R)TES special/Typhoon FGR4 c/s “Apollo 3” – Ground abort. 84007/847/TSFE/Tp84 Hercules c/s “Mike Tango Yankee 847” to Donna Nook- Flare trials. 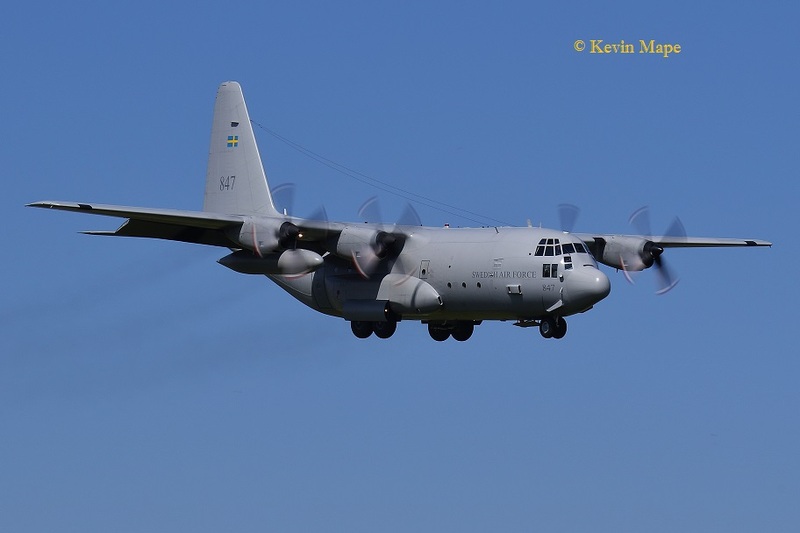 ZH101/8Sqn/Sentry AEW1 c/s “NATO 35” – Departed. ZJ809/EY/6Sqn/Typhoon T3 c/s “Lossie 33” – To Echo. 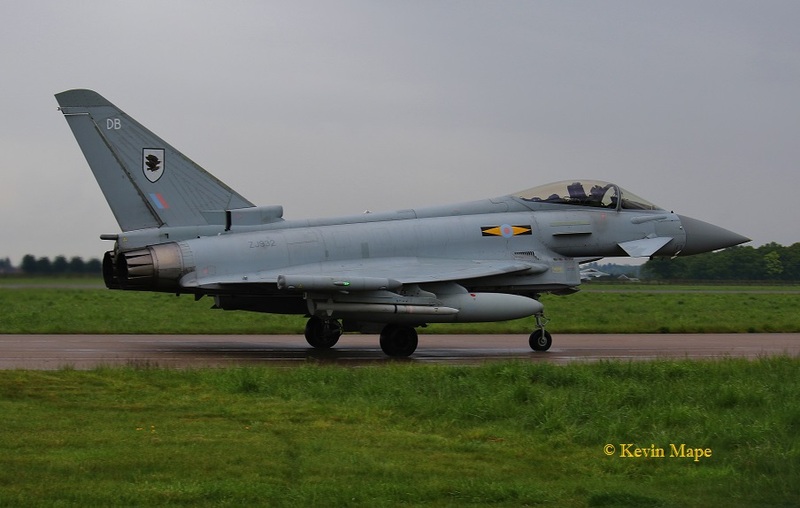 ZJ809/EY/6Sqn/Typhoon T3 c/s “Lossie 03” – Departed. G-MAJH/JH/Eastern/Jetstream 41 c/s “East Flt 103” in “104” – out. 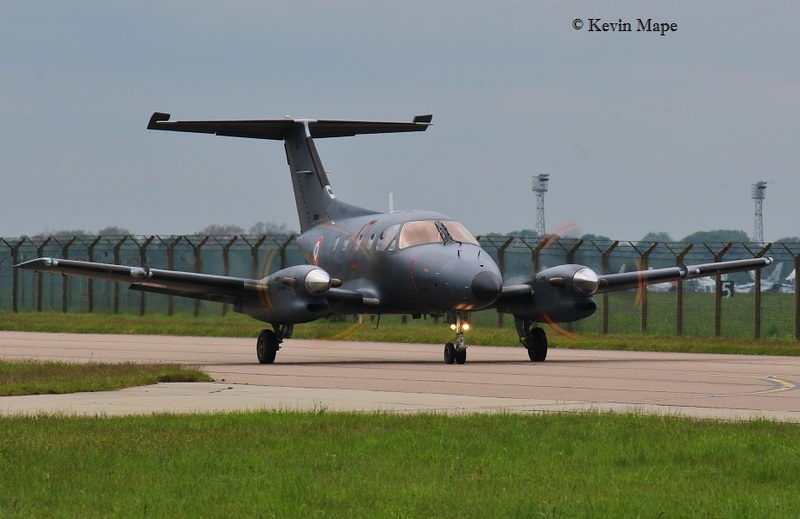 ZH101/8Sqn/Sentry AEW1 c/s “NATO 35” – Landed. 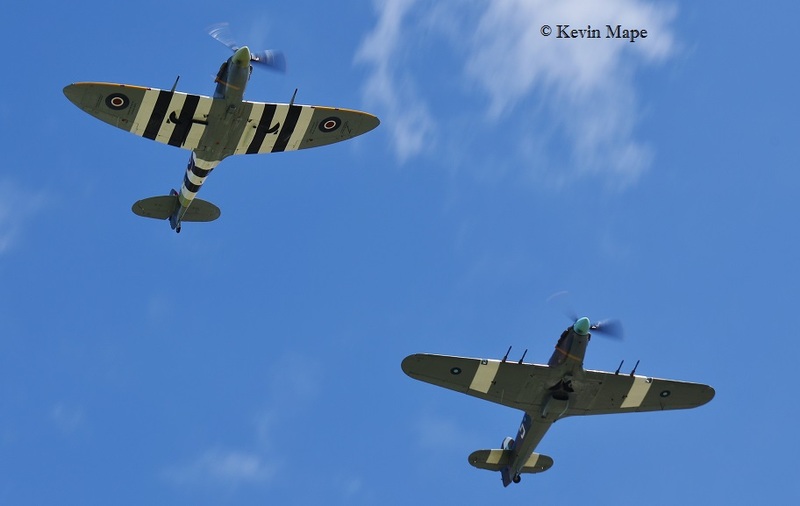 TE311/4D-V/BBMF/Spitfire LF XVIe c/s “Spitfire 92” – Petwood Flypast. 12th Thur Log thanks to Rich. No.090/ZF/EAT00.319/Xingu c/s “Cotam 1725” – Parked on Sierra. Outside the north side of the Hangar. Outside the south side of Hangar. 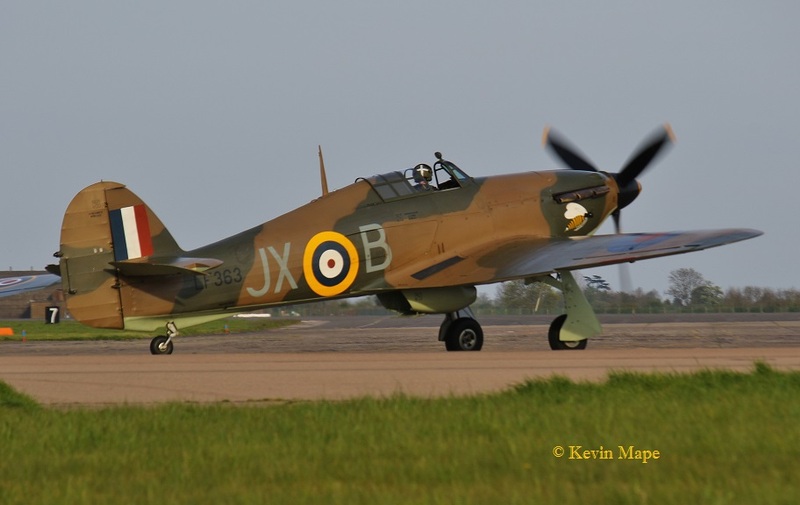 PZ865/EG-S Hurricane IIc – departed staying overnight Blackpool. 16th Mon – Log thanks to Garf. 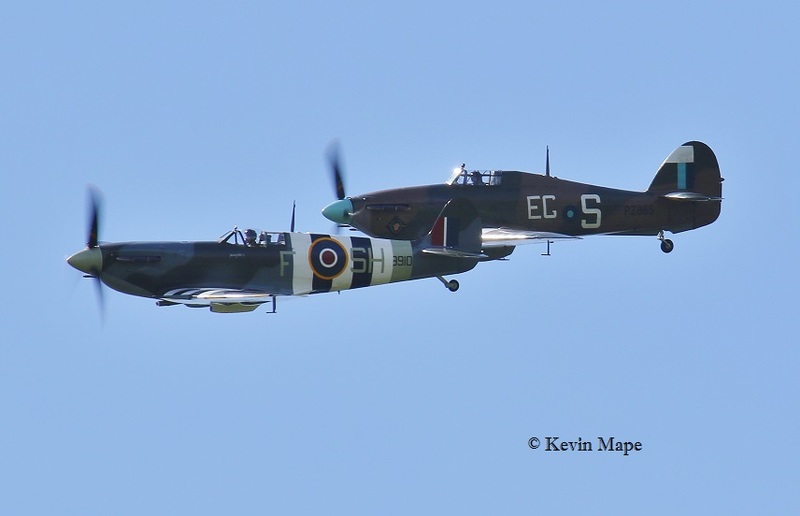 AB910/SH-F/BBMF/Spitfire Vb s/s “Spitfire 90” – Test flight. ZJ692/5Sqn/Sintenil R1 c/s “Ascot 7335” – Parked on the ASP. 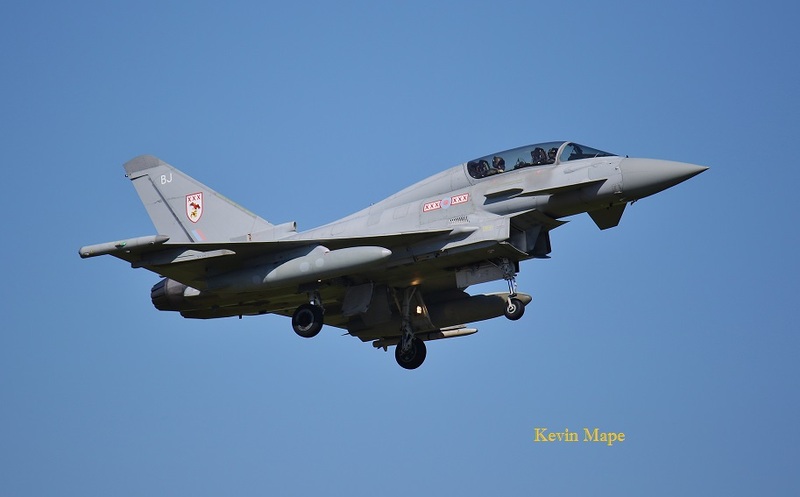 ZK339/EB-E/41(R)TES/Typhoon FGR4 c/s “Apollo 1” – Ground abort – Problems at Aberporth Range. “Apollo 2” – Ground abort. ZA947/UK/BBMF/Dakota III c/s “Dakota 95” – Display practice. 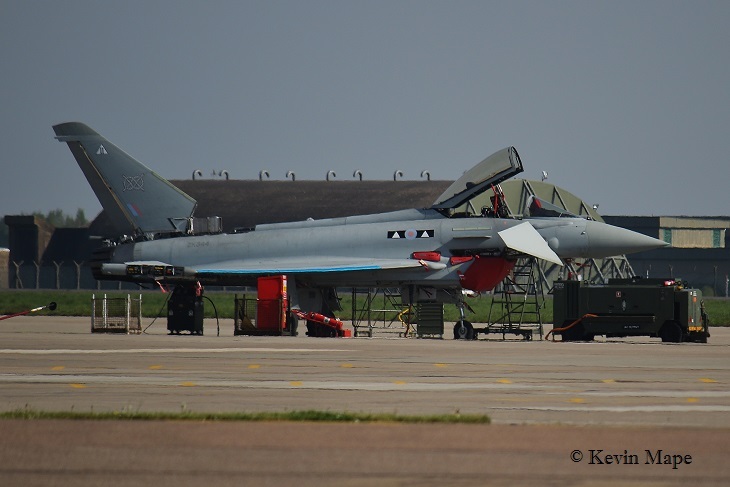 ZK324/EI/6Sqn/Typhoon FGR4 c/s “Lossie 78” – Parked on the ASP. 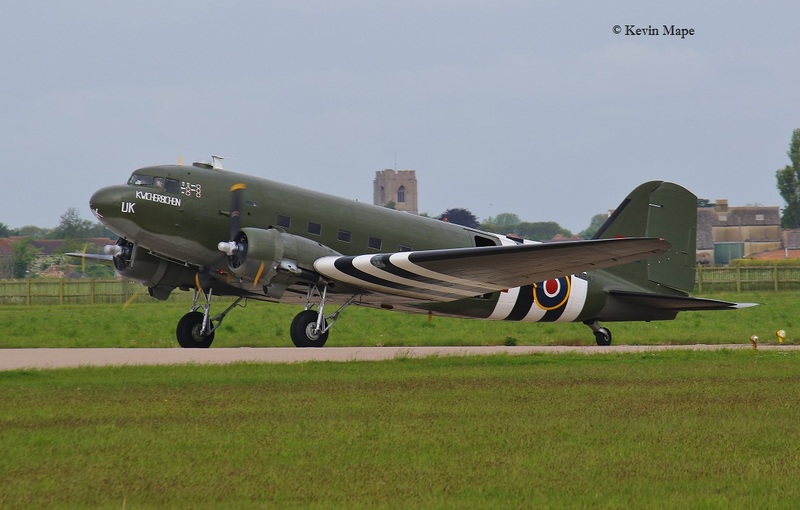 ZA947/UK/BBMF/Dakota III c/s “Dakota 97” – Display practice. G-BYWH/Tutor T1 c/s “Wittering 57” – Overshoot. ZJ930/Unmarked/Typhoon FGR4 – Later towed to 29(R)Sqn Hangar. AM Log thanks to Susie Matson. ZK339/EB-E/41(R)TES/Typhoon FGR4 c/s “Apollo 1” – To Aborporth Range. 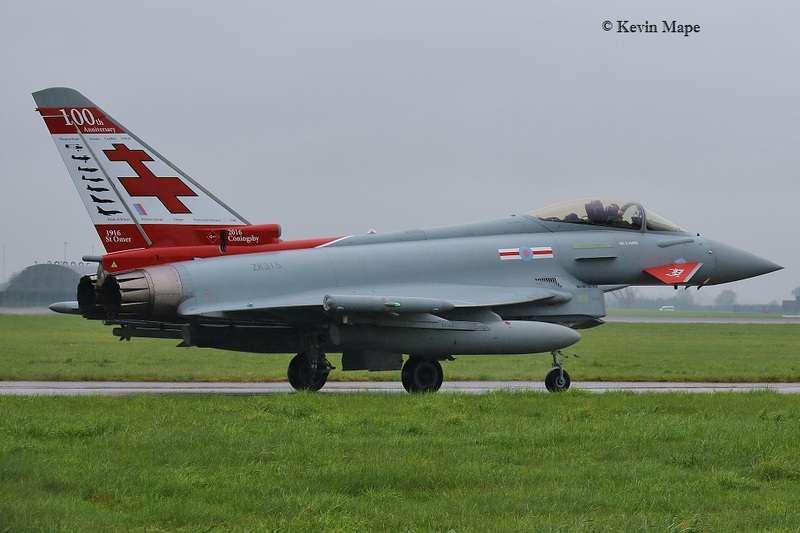 ZJ947/EB-L/41(R)TES/Typhoon FGR4 c/s “Apollo 2” – To Aborporth Range. 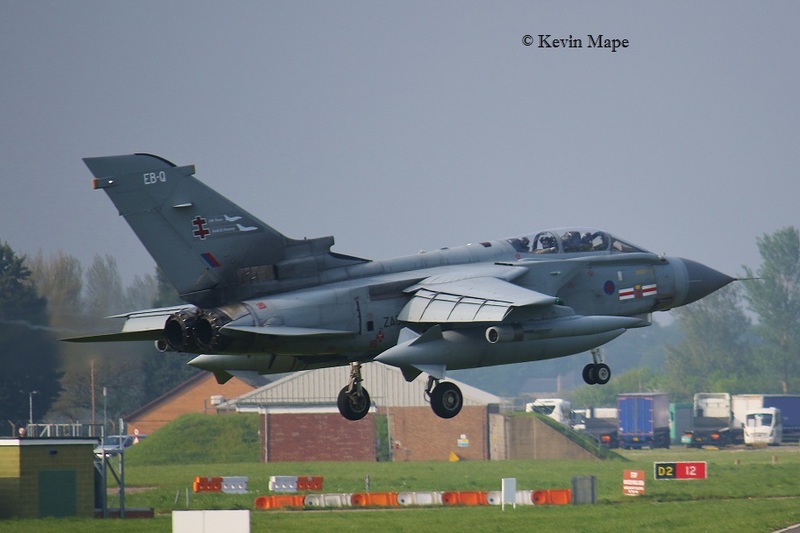 ZA607/EB-X/41(R)TES/Tornado GR4 c/s “Rebel 84” – Ground abort – Left nozzle failure. 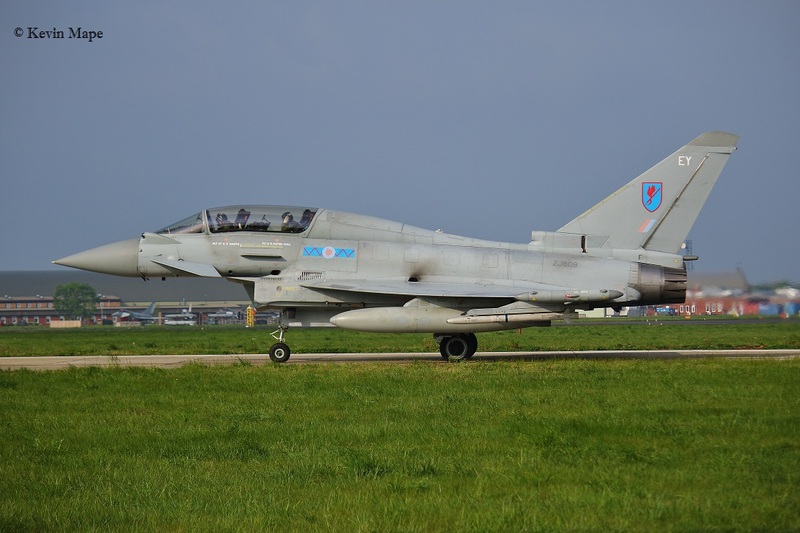 ZJ931/DA/XI(F)Sqn/Typhoon FGR4 c/s “1 Alpha Juliet 31” – QRA practice. 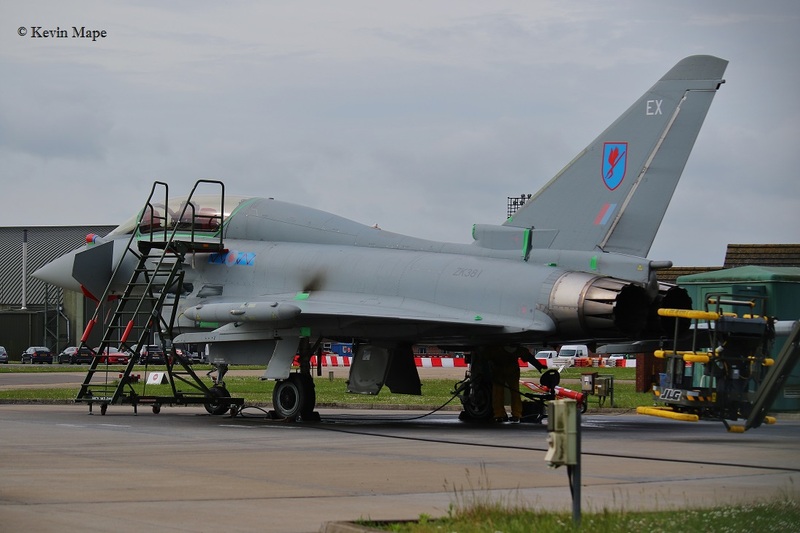 ZJ931/DA/XI(F)Sqn/Typhoon FGR4 – QRA radio check 15-27pm. 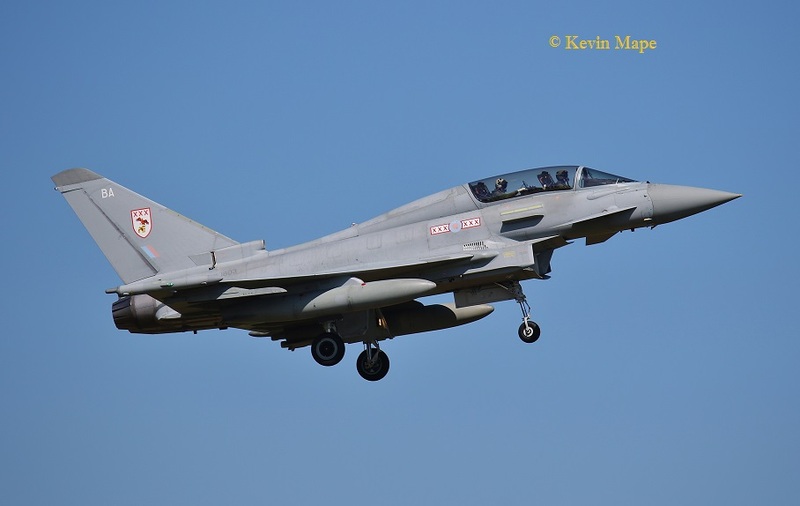 ZK315/41(R)TES special/Typhoon FGR4 c/s “Rebel 41” – Landed. ZJ932/DB/XI(F)Sqn/Typhoon FGR4 c/s “Typhoon FGR4 c/s “Typhoon 73” – PD at Newcastle. 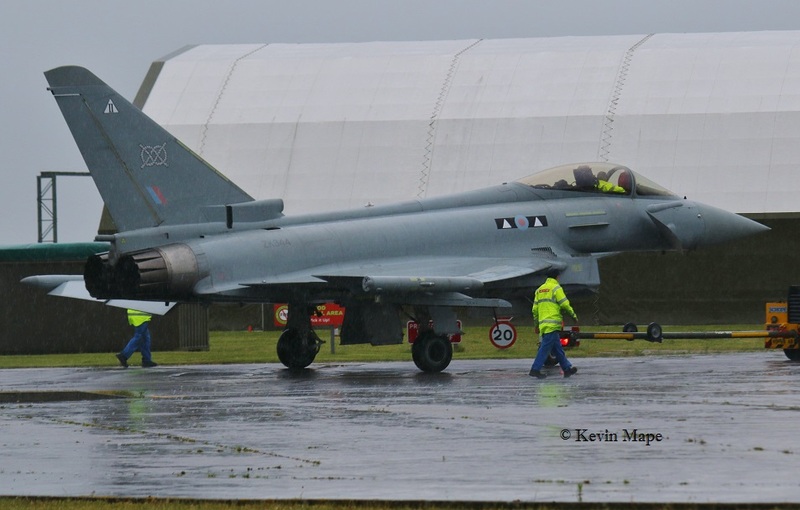 ZJ944/Unmarked/Typhoon FGR4 -Noted on the Wash pan. 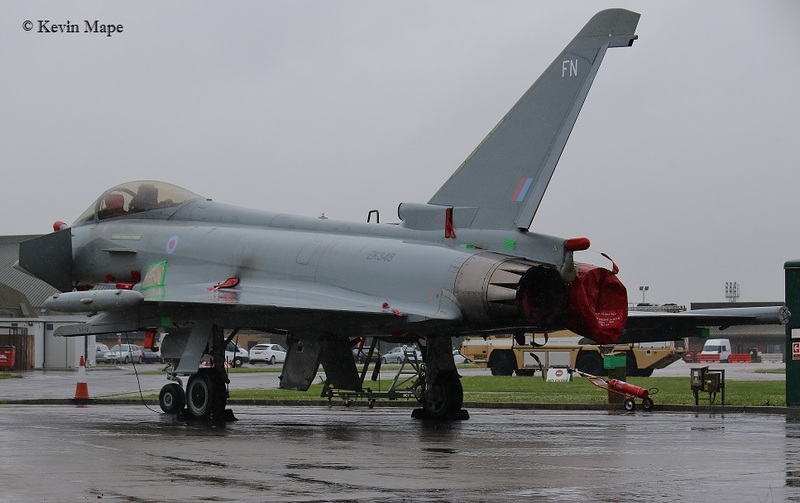 ZK346/ER/6Sqn/Typhoon FGR4 – Noted in the paint shop. 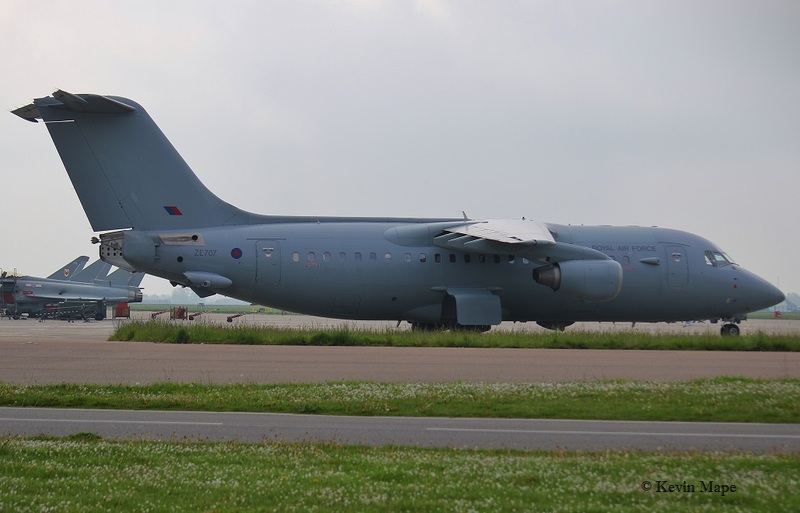 ZE707/32(TR)Sqn/Bae 146 C3 c/s “Ascot 1476” – Departed. 09-0525/89MAG/C-37B c/s SAM 303″ – From Northolt with OC USAF for a flight in the BBMF Dakota – Parked on the ASP. 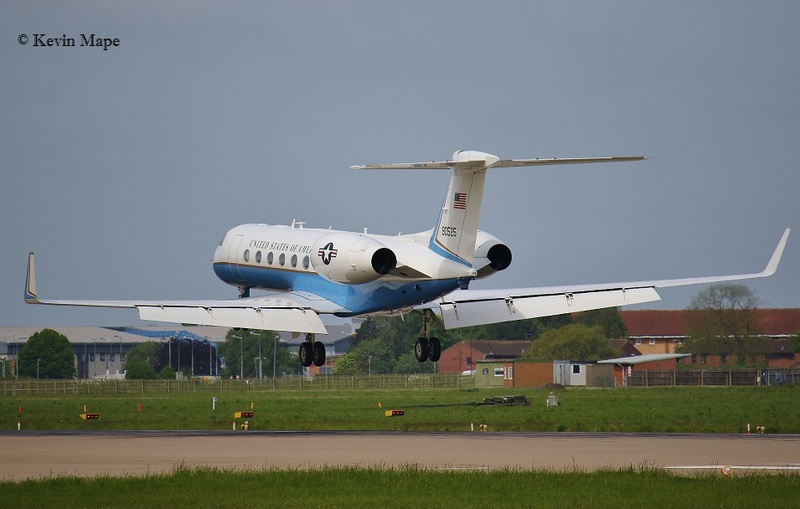 09-0525/89MAG/C-37B c/s SAM 303″ – To Andrews AFB. 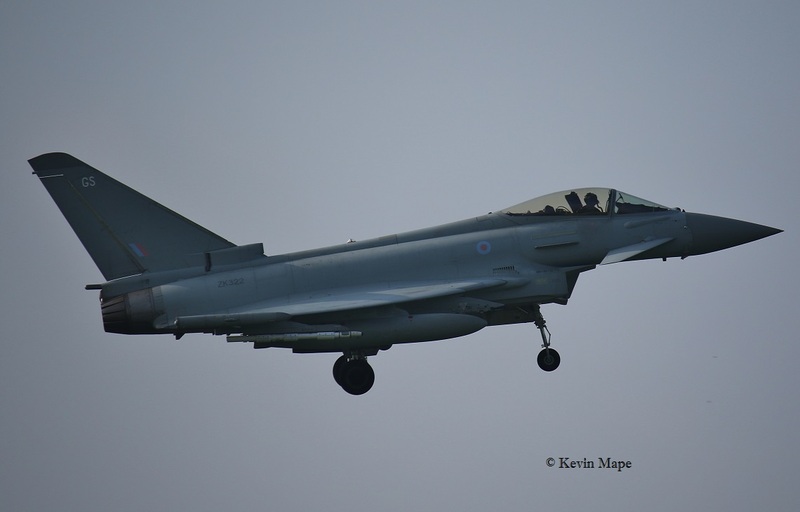 ZK301/Unmarked/Typhoon FGR4 – f/n ex D 1435 Flt. – Towed to TMF. 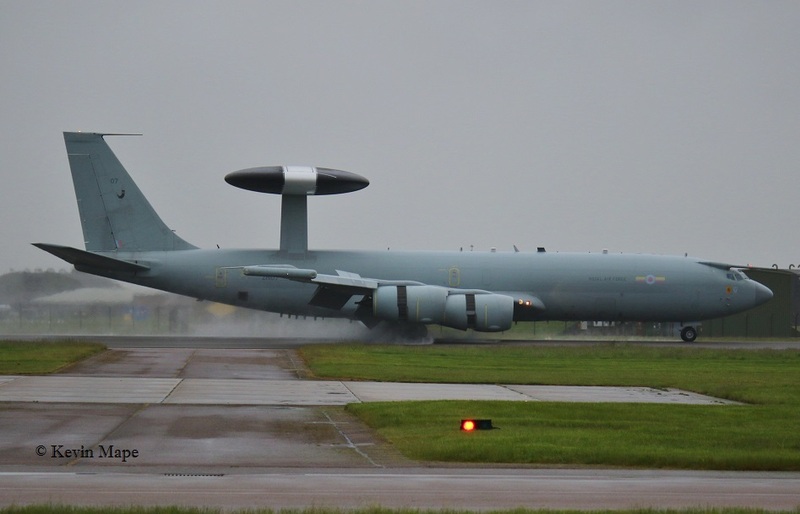 ZH107/07/8Sqn/Sentry AEW1 – Parked on Jacks. No.103/YT/EAT00.319/Xingu c/s “Cotam 1734”- Parked on Sierra. ZJ919/DC/XI(F)Sqn/Typhoon FGR4 c/s”******” – Diverted to Marham . 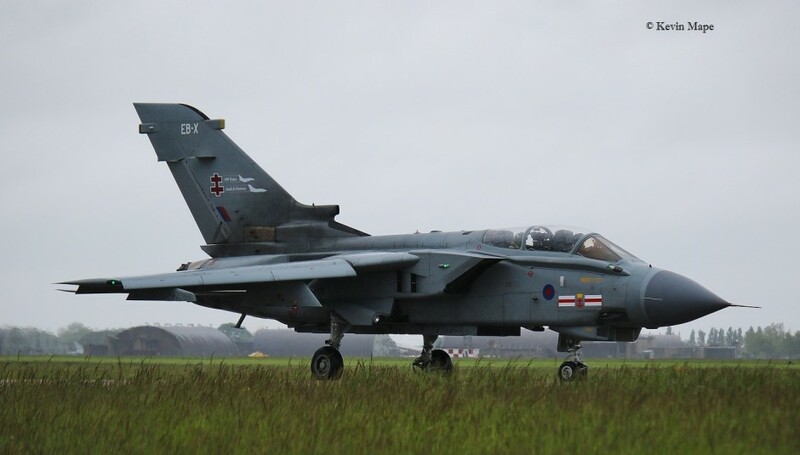 ZJ917/DG/XI(F)Sqn/Typhoon FGR4 c/s “*****” – Both tyres blew on take off, He was able to abort take off and stop at the 25 end of the runway. The runway was closed due to fod and damage to the runway. 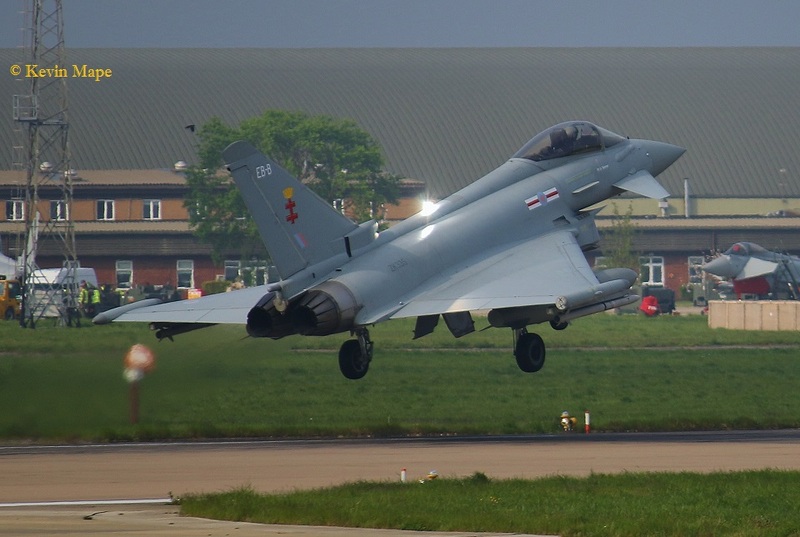 The Typhoon’s in the air diverted to Marham. No.103/YT/EAT00.319/Xingu c/s “Cotam 1734”- Departed. 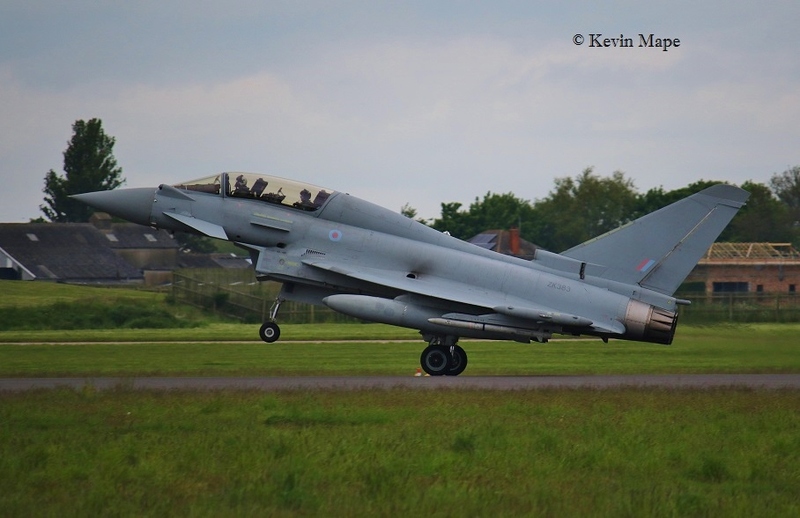 ZJ919/DC/XI(F)Sqn/Typhoon FGR4 c/s “Razor 11” -Landed. ZJ936/QO-C/3(F)Sqn/Typhoon FGR4 c/s “Typhoon 17” – To Shawbury for Storage. ZJ912/DR/XI(F)Sqn/Typhoon FGR4 – Towed from Echo to Paint shop. 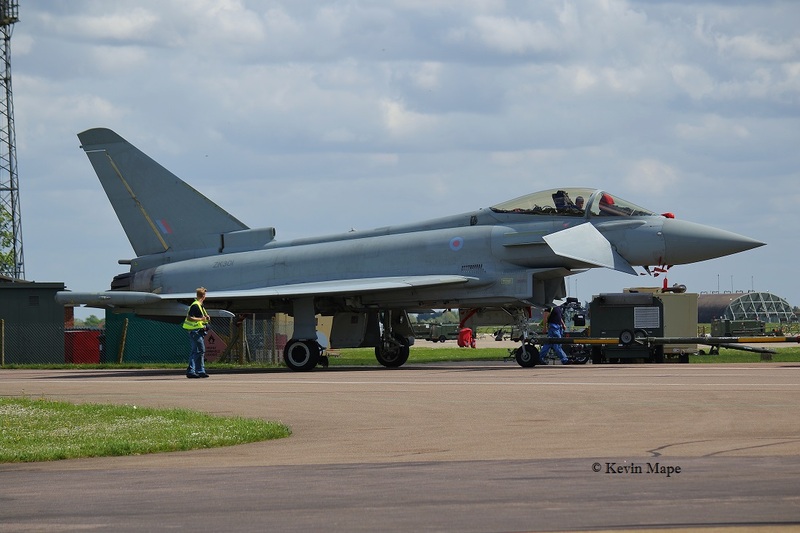 ZJ919/DC/XI(F)Sqn/Typhoon FGR4 – Towed from Echo to Hangar 2. ZK352/Unmarked/Typhoon FGR4 c/s “Typhoon 35” – Display. 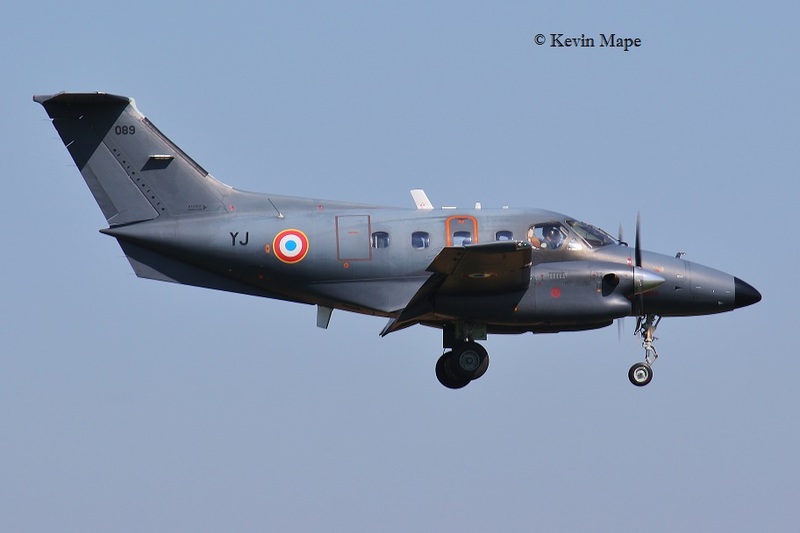 G-FRAR/AR/Cobham/Falcon 20EW c/s “Zodiac 51” – Departed. 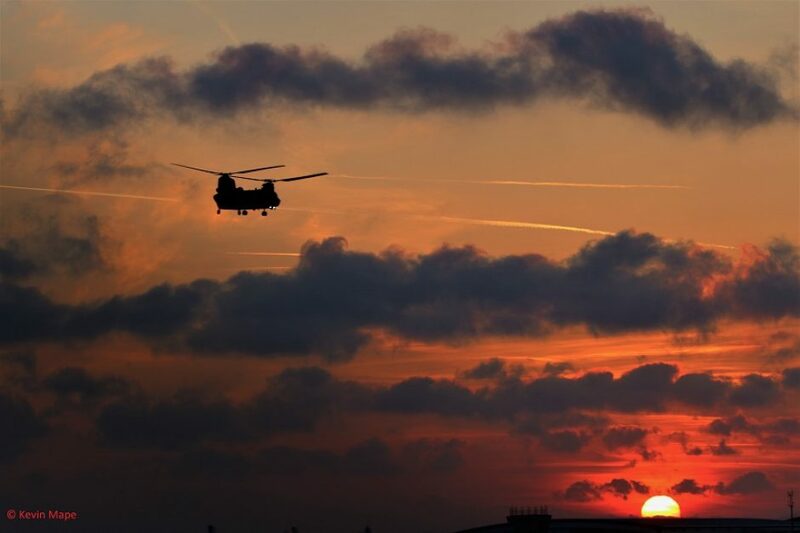 ZJ812/BK/ – From Foxtrot to 29(R)Sqn. 25th Wed Log thanks to Garf. “Zircon 12” – Grouund abort. ZJ808/BP/29(R)Sqn/Typhoon T3 c/s “Gunfighter 33” – Ground abort. 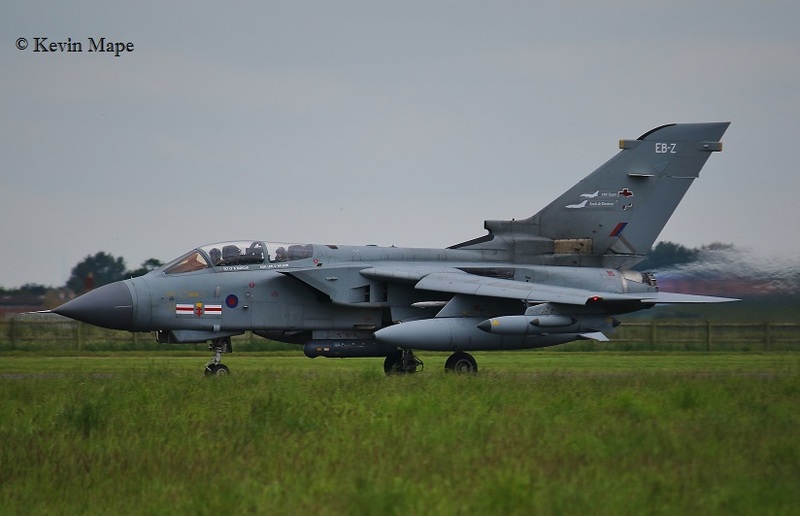 ZA560/EB-Q/41(R)TES/Tornado GR4 c/s “Rebel 88” – PD Durham – Teeside. 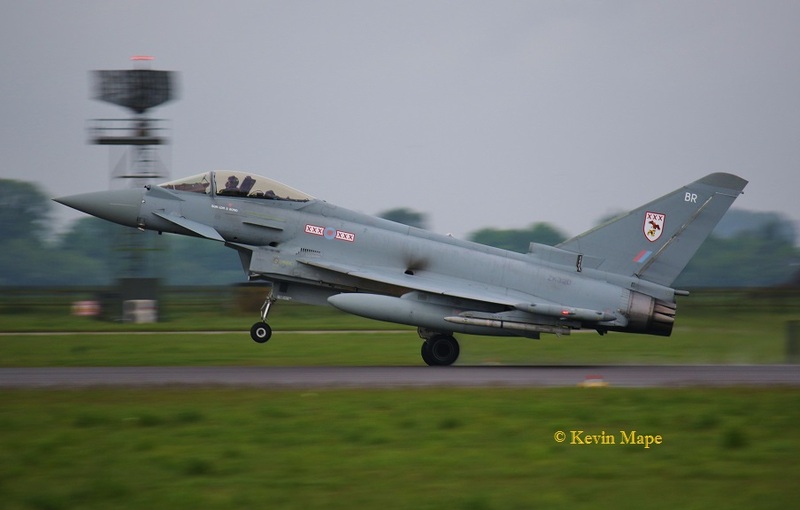 ZK320/BR/29(R)Sqn/Typhoon FGR4 c/s “Triplex 21” – Ground abort. 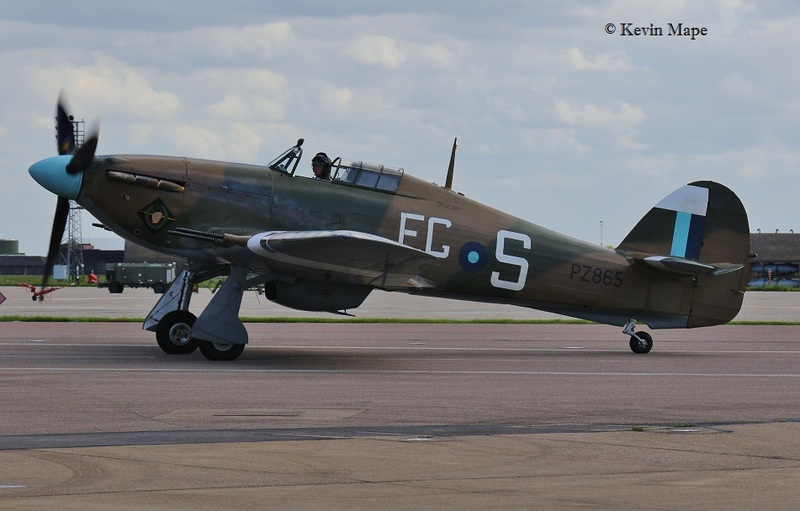 LF363/JX-B/BBMF/Hurricane IIc c/s “Hurricane 90” – Taxy run. 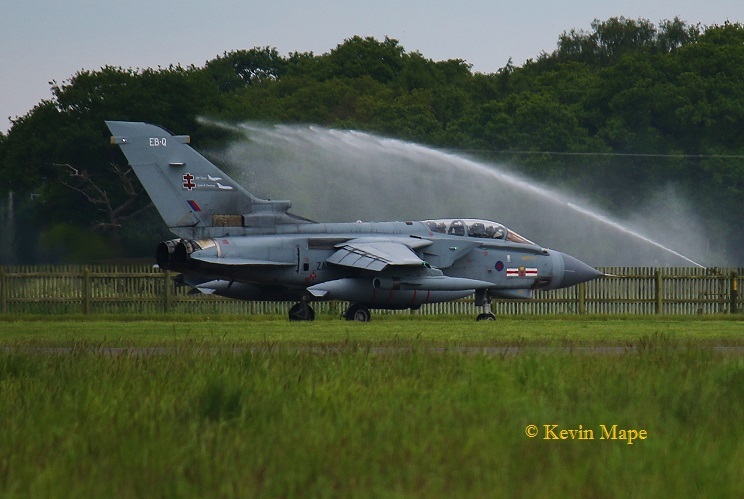 ZA607/EB-X/41(R)TES/Tornado GR4 c/s “Rebel 88” – Departed clean. ZK331/BT/29(R)Sqn/Typhoon FGR4 c/s “Warlord 61” – Carrying Paveway. 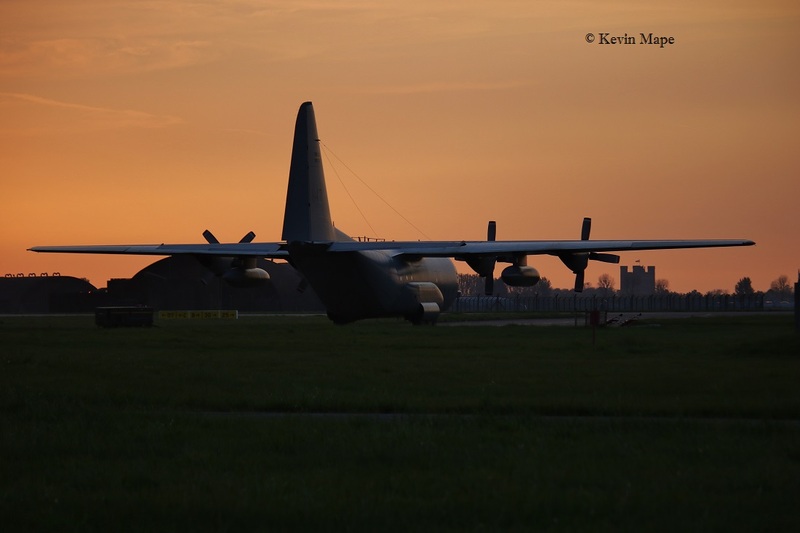 ZH107/07/8Sqn/Sentry AEW1 c/s “NATO 33” – PD Brize Norton. 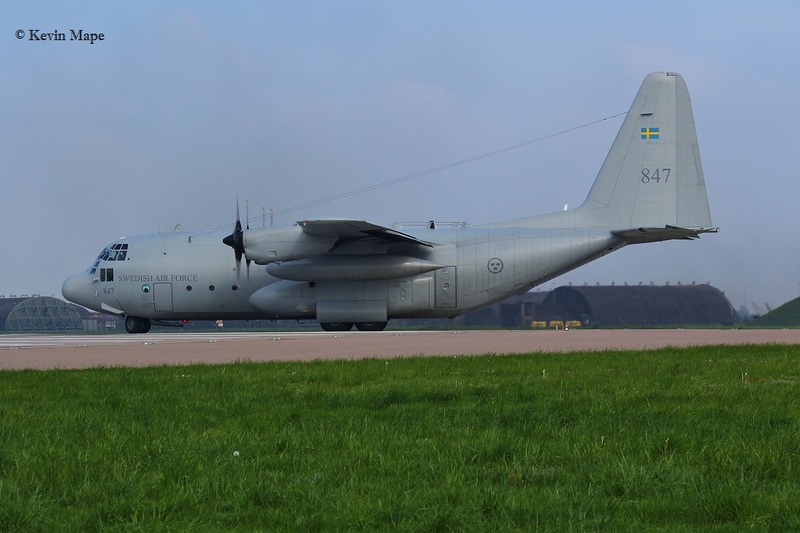 ZH107/07/8Sqn/Sentry AEW1 c/s “NATO 33” – Rollers then landed. 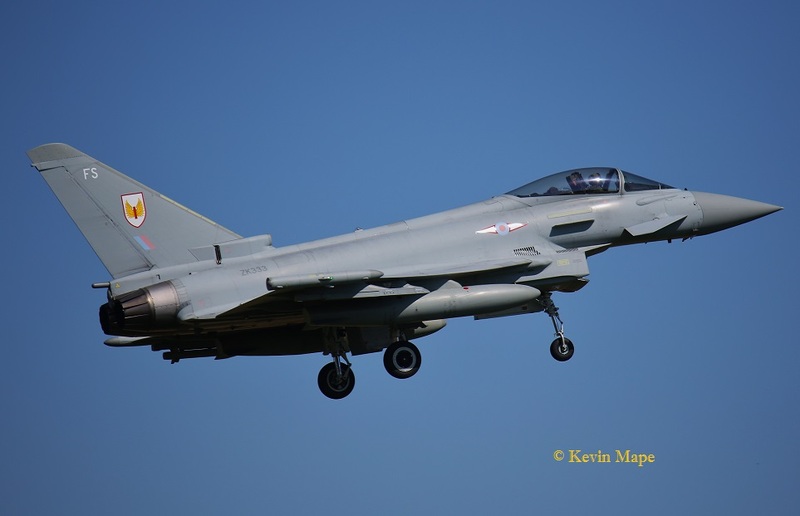 ZJ932/DB/XI(F)Sqn/Typhoon FGR4 c/s “Typhoon 67” – Departed clean – did not return – To Shawbury? No.090/ZF/EAT00.319/Xingu c/s ” Cotam 1724″ – Departed. 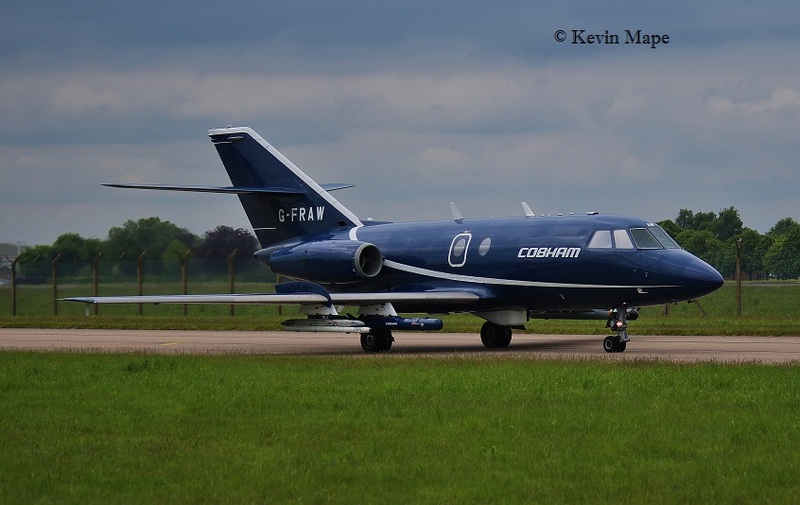 G-FRAW/AW/Cobham/Falcon 20EW c/s ” Rushton 89″ – Departed. 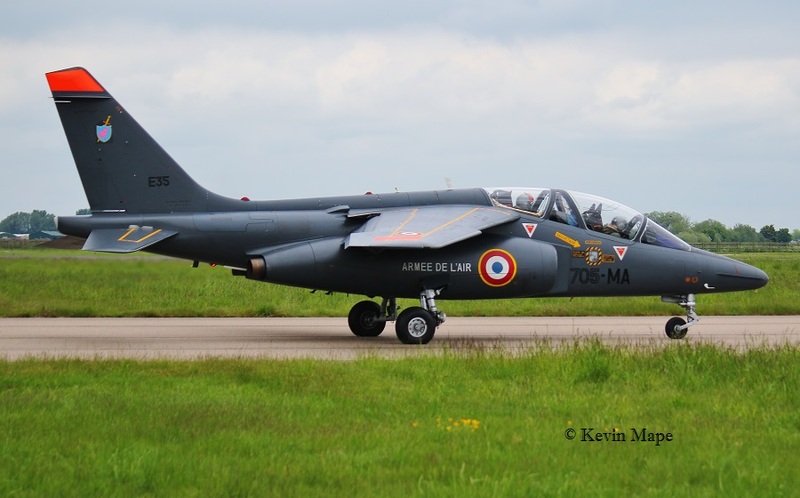 E35/705-MA/EAT00.314/Alphajet E c/s “French Air Force 6443: – Departed to Valley. G-MAJH/JH, Eastern Jetstream 41 c/s “East flight 101” in, “102” out. ZK352/BV/29(R)Sqn/Typhoon T3 c/s “***********” f/f in code. G-MAJH/JH, Eastern Jetstream 41 c/s “East flight 103” in, “104” out. Spray Shop – ZK344/II(AC)Sqn – towed out of the TMF still in full marks. Typhoon FGR4 into Storage at Shawbury. ZJ936/QO-C/3(F)Sqn marks – Left Coningsby – 23/5/16 c/s “Typhoon 17”. ZJ931/DB/XI(F)Sqn marks -Left Coningsby – 26/5/16 c/s “Typhoon 67”. Noted in TMF this month.